On this tour we spend four nights on the Monserrat embarking on a Galapagos cruising adventure through the archipelago's western and central islands. Join us as we snorkel with playful sea lions, discover the unusual endemic marine life in secluded bays, visit the tortoise breeding centre on Isabela Island and hike the Sierra Negra Volcano. Please note that this tour is operated in conjunction with a local specialist company and is not exclusive to Explore customers. Your fellow passengers may come from a number of different countries although all guiding is done in English, and may include families. Quito is Ecuador's mountain capital and the second highest capital city in Latin America (2850m). One of South America's most beautiful cities, Quito lies in a narrow valley at the foot of the Pichincha Volcano, surrounded by snow-capped mountains and extinct volcanoes. Quito is separated into the old and the new cities. The old city is a UNESCO Heritage site due to its rich blend of colonial architecture, imposing churches and bustling local markets. Some of the main sites include the Plaza de la Independencia, the cultural heart of the colonial city which is home to the Catedral de Quito, and La Compania church which is considered one of the most beautiful churches in the Americas with its magnificent gilded altars, walls and ceilings. The church of San Francisco, Quito's largest and oldest colonial church built in 1553, is also worth a visit. A climb to the top of Cerro Panecillo affords one of the best views across the city and the surrounding mountains, presenting you with an unparalleled vista of the encircling Andes from the viewing platform offered by the statue of the Virgen de Quito. Today we transfer to the airport early for our flight to the Galapagos Islands via Guayaquil (refueling stop only, you will not disembark the plane). Lying on the Equator, 970km west of the Ecuadorean coast, the Galapagos National Park is a unique collection of islands, formed by volcanoes over hundreds of thousands of years and consists of six main islands, 12 smaller islands as well as over 40 small islets, supporting a distinct and unique flora and fauna, including prehistoric creatures found nowhere else on earth. This desolate and fantastic habitat was discovered in 1535 by Fray Tomas de Berlanga. One of the original designations by him was Las Islas Encantadas, the Enchanted Isles. Charles Darwin visited the islands on the Beagle exactly three hundred years later, in 1835. He observed the total isolation of the giant reptiles and other creatures, and this played a substantial part in his formulation of the theory of evolution. The Galapagos have never been connected with the continent. Gradually, over many hundreds of thousands of years, animals and plants from over the sea somehow migrated there and as time went by they adapted themselves to Galapagos conditions and came to differ more and more from their continental ancestors. Thus many of them are unique: a quarter of the species of shore fish, half of the plants and almost all the reptiles are found nowhere else. In many cases different forms have evolved on the different islands. Of the extraordinary animals to be found in the Galapagos many are reptiles, such as the great tortoise, large land iguanas, numerous lizards and three species of non-poisonous snakes. There are also several species of turtle, which come ashore to mate. Up to three quarters of a million seabirds flock to the islands, including a third of the world's blue-footed boobies, frigatebirds, pelicans, cormorants, albatross and petrels. Only 35cm tall, the Galapagos penguin can be seen swimming among tropical mangroves, whilst offshore it is common to see dolphins, sea lions and fur seals playing in the water. Fearless though not tame, the extraordinary wildlife can be easily approached and the opportunities for photography are superb. The Galapagos National Park charges a visitor fee of $110 USD, payable on arrival, which funds park maintenance and supervision in the Galapagos, as well as ecological study, conservation and infrastructure development in Ecuador's other national parks. Entry fees and the funds they generate for the national park system are among measures taken by the Ecuadorian government to protect its natural heritage. On arrival in Baltra, we will meet our naturalist guide and transfer to our home for the next four nights, the Monserrat. After lunch, we will enjoy our first snorkelling trip to Mosquera Islet. In the morning, we will hike the Sierra Negra Volcano, considered to be the oldest volcano in the Galapagos. The volcano boasts the largest basaltic caldera in the Galapagos at an impressive 12km and dominates the southern half of the island, presenting us with some spectacular views from the top across the island and towards Santiago to the northeast. The volcano last erupted in October 2005, making it the most recent eruption of the Galapagos. In the afternoon, we will visit the Tintoreras Islands. These islands were formed from the lava flows from volcanoes and are fantastic for viewing wildlife. The bay in front of the islands is home to a colony of white tip sharks. You will also have the opportunity to see the 'Wall of Tears' which pays homage to prisoners forced to build the wall of huge blocks of lava between 1946 and 1959 when a penal colony was on the island. Many prisoners died during its construction. Finally, we will visit the tortoise breeding centre at Puerto Vilamil (Isabela Island) to see some of the famous giant tortoises of the Galapagos. In the morning the boat arrives to a small little island off the southern tip of Santiago Island called Sombrero Chino or 'Chinese Hat', named for its unique shape. Chinese Hat comprises of a tilted cone and lava flows that run down to the coast. Here it is often possible to see Galapagos penguins and the abundant marine life, including rays, turtles and sea lions, make for great snorkelling possibilities. There is also a large sea lion colony here as well as many marine iguanas that can be seen on our guided walk among the volcanic scenery which offers good views to the cone of the island's volcano. In the afternoon we will take an excursion to Rabida Island, where we will land on a red sand beach. From here a short trail leads to a salt water lagoon, often home to wading flamingos. Another trail goes past the lagoon to the interior, where the revered Palo Santo trees grow. When burned, the branches of this tree give off a pleasing aroma and ward off mosquitoes. Back on the beach among low-lying bushes nest the prehistoric-looking pelicans. This is the best area for close viewing of these nesting birds, and it's a rare treat to watch parent pelicans return with gullets full of fish for the squawking youngsters. Today is spent on Santiago Island. This island has seen its share of human activity from whalers and pirates over the years, and despite the introduction of goats to the island many years ago, the wildlife of Santiago has flourished and provides outstanding viewing opportunities. The island boasts marine iguanas, sea lions, fur seals, land and sea turtles among others, which provide great wildlife viewing both on land and in the water. In the morning we will visit Puerto Egas to see the salt crater as well as a dark sand beach and tidal pools and the ever friendly fur seals. Next, we will travel to Playa Espumilla, one of the most idyllic beaches in the Galapagos Islands, boasting thick mangroves along with flamingo and sea turtle nesting sites. Then we continue to Buccaneer Cove to witness its towering cliff wall rock formations. Today we set sail for North Seymour Island, just north of Baltra Island, which is home to sea lions, marine iguanas, swallow-tailed gulls, Magnificent frigatebirds and blue-footed boobies. North Seymour Island is probably the most exciting island photographically. Birdlife abounds, and close to the trail you will find many nesting pairs and young chicks. North Seymour is also home to the Galapagos' largest colony of Magnificent frigatebirds. Their mating ritual is an ostentatious display; males expand the red sack at the base of their throat and perch atop a bush with wings fully extended, flapping furiously. Interested females circle overhead, and if so inclined, may join the male on terra firma. Further along the trail we can observe a colony of sea lions. Then we transfer to the airport for our flight to Quito via Guayaquil (refueling stop only, you will not disembark the plane). On arrival back on the mainland, we transfer to the hotel for our final night in Ecuador. The tour ends in Quito this morning after breakfast. Papallacta Hot Springs (Full day) - US$100 (1 Pers) US$50 (2+ pers) plus US$7 Entrance fee per person. This is transport only Spa treatments are extra. Cable Car - US$3 taxi ; Entrance US$8 You can get from 2.800 m to 4.200 m in 10 minutes and view Quito at your feet. Please note that optional activities will need to be paid in cash and do not include lunch - please allow US$10 accordingly. We recommend that you do not bring too much clothing as space is limited in the cabins. We would recommend you bring a fleece top, waterproof jacket, 4 shirts/T shirts, 1 pair of shorts, 2 pairs of trousers and 1 pair of hiking trousers. You will also need a swimsuit. Bring comfortable walking boots or shoes and trainers or sandals with a good grip. Plastic sandals (not flip flops) are useful for wet landings. We recommend the use of a duffel bag or backpack (whichever you find easiest to carry). A good size daypack is also essential. If you don't wish to take your entire luggage with you to Galapagos, please ensure you have an extra bag you can leave behind at hotel storage and pick up on your return. Please note that the amount of luggage you can bring on the boat is LIMITED due to small cabin size. We recommend travellers use soft sided duffel bags of 40-50 litres in capacity. We will accept luggage types onboard, however if you are a single traveller sharing with another traveller, it's especially important to keep in mind that cabins are small in size and it's best to pack light. Pack a torch, water bottle, sunglasses, insect repellent, high factor sunscreen, a beach towel, waterproof bag for camera and motion sickness tablets/patches for the boat. You may also wish to take binoculars. Onboard the Galapagos yacht, tipping the naturalist guide and boat crew is customary. There will be two envelopes presented at the end of the voyage, one for the guide and one for crew members. The recommended amount is $15-18 USD per day from each traveller ($5-7 USD for the guide and $10-11 USD for the crew members). This is only a suggestion as we understand that tipping is a personal choice. 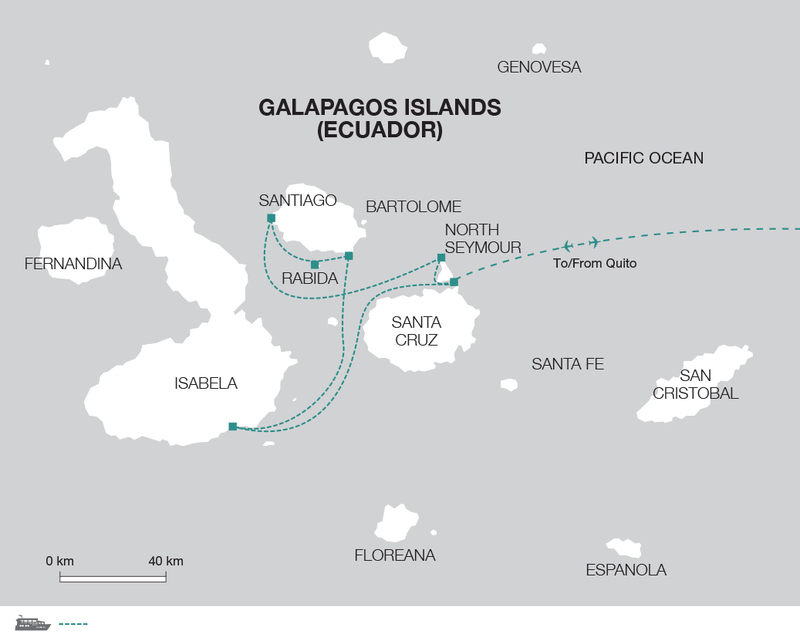 The Ecuadorian government currently levies a Galapagos Islands Park entry fee of $120 USD per person. This is payable at the airport upon arrival in the park. It is not included in the cost of the tour, and must be paid in CASH. This fee funds park maintenance and supervision in Galapagos, as well as ecological study, conservation and infrastructure development in Ecuador's other national parks. Entry fees and the funds they generate for the national park system are among measures taken by the Ecuadorian government to protect its natural heritage. Featuring a spacious top deck with a bar, a large sundeck and a comfortable dining room and lounge area for briefings and relaxing, the Monserrat's common spaces are as roomy as her cabins. All cabins have side by side berths, private bathrooms and air conditioning. All meals are provided and are served aboard the vessel. The Monserrat boasts our highest passenger to expert ratio including a cruise director and a naturalist guide for every ten passengers. Snorkelling equipment and beach towels are included at no extra charge and wetsuits are available to rent. At times, when the Monserrat is being serviced, we will use another boat of equivalent standard and size. Please note that the rooming on our Galapagos yachts is done on a first-come, first-serve basis, and we are not able to guarantee the specific cabin you will receive on board. The cabins are comfortable and clean, all with private bathrooms. Due to the specific location of the cabins on board, the window sizes vary as well as the noise at times when the boat is navigating, given the proximity of the cabins to the engine room. Our friendly and competent crew will ensure a smooth and comfortable journey for the duration of your tour. On this tour, the price is based on a lower deck cabin. You can upgrade to an upper deck cabin if you wish for £100. On our Galapagos yachts, food is included, plentiful and made of fresh local ingredients. Dining is casual, tables are unassigned and the dining room is capable of seating the entire passenger compliment at one time. There is always a selection of different meals available, and vegetarians will find plenty of options. Special dietary requirements can be accommodated with advance notice, please advise us at time of confirmation. Coffee, tea and water are all provided free of charge. All other beverages, alcoholic and non-alcoholic are not included and can be purchased at the bar.